BISHOP JAMES E. DANIEL, an anointed preacher of the Gospel destined for greatness, has been the pastor of Philadelphia Ministries in New Orleans, Louisiana for 32 years. Bishop Daniel has been actively involved in many leadership capacities. He is the former President of the Louisiana District Council Young People’s Union. He then became the Treasurer, Vice-chairman, and Chairman of the Louisiana District Council General Body. In June of 1987 he was elevated to the position of District Elder under the leadership of the late Bishop Frank Branscumb and later elevated to the position of Suffragan Bishop under the leadership of Bishop G. F. Austin. 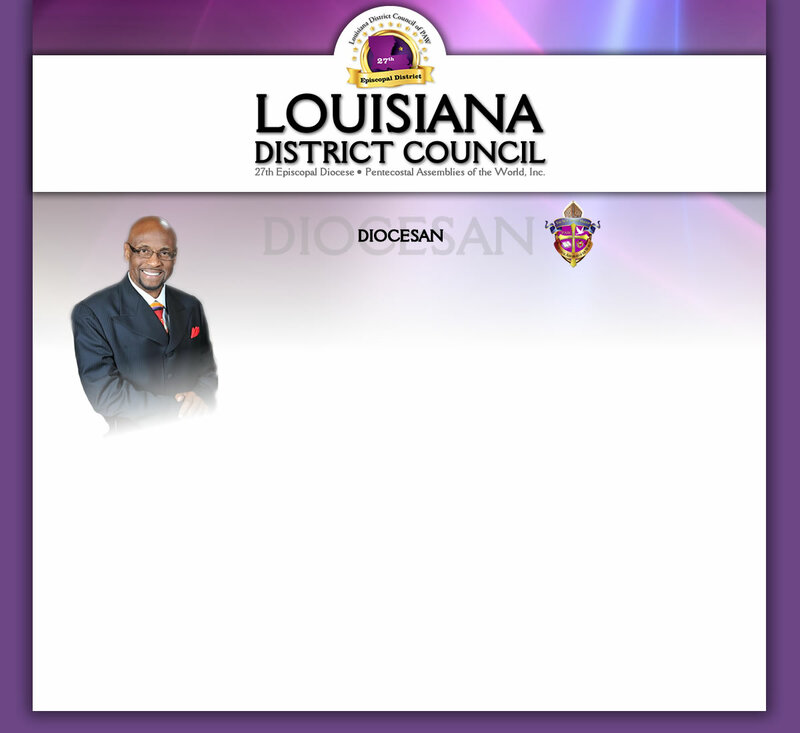 In March 2014 the Board of Bishops elected Suffragan Bishop Daniel to the office of Diocesan Bishop of the Louisiana District Council. He has served on the Board of Directors for Aenon Bible College, the educational arm of the Pentecostal Assemblies of the World. Bishop Daniel was listed among the Who’s Who for Professional Management Achievement of 2000. Over the years, he has also received numerous awards and certificates for his work and efforts in the community. Bishop Daniel studied Art Education at Savannah State College, Savannah, Georgia; Business Management at Northwest Institute in Midland, MI and Real Estate at Delgado Community College, New Orleans, Louisiana. He is a Louisiana State Licensed Insurance Agent and holds a Bachelor of Arts Degree in Biblical Studies from Friends International University. He also holds an Honorary Doctorate Degree from Aenon Bible College. God gave Bishop Daniel a partner in his vision, Evangelist Janette Greggs Daniel. Together, they have been married for 39 years. They have four daughters; five grandchildren; and one great grandchild. Through His leadership, the vision for ministry is being brought to the forefront with the following corporations: J. E. Daniel Ministries and Philadelphia Community Development Center. In the year 2000, Bishop Daniel’s vision expanded to a second location on the Westbank, located in Terrytown, LA. In 2003, the vision expanded to a third location, Philadelphia Ministries Northshore. Since Hurricanes Katrina and Rita, the vision has expanded to Houston, TX. Due to the loss of the Eastbank location, the ministry is currently fellowshipping at our Westbank location in Terrytown, Louisiana, which also serves as the new headquarters for Philadelphia Ministries, Int’l. Bishop Daniel has been seen and heard on both the local and national levels through his radio and television outreach broadcasts called the REFRESHING WORD. Bishop Daniel has ministered the Word of God Worldwide. Through his teaching and preaching many sons and daughters have been birth in the gospel and now are pastoring in Oklahoma, Florida, Virginia, Texas, Tennessee, Mississippi, and Louisiana. Many lives have been touched, revived, inspired, delivered, and saved.